OBAMA: "Tonight, I am announcing that the American combat mission in Iraq has ended." THE FACTS: Peril remains for the tens of thousands of U.S. troops still in Iraq, who are likely if not certain to engage violent foes. Counterterrorism is chief among their continuing missions, pitting them against a lethal enemy. Several thousand special operations forces, including Army Green Berets and Navy SEALs, will continue to hunt and attempt to kill al-Qaida and other terrorist fighters — working closely with Iraqi forces. Obama said, "Of course, violence will not end with our combat mission," while stopping short of a full accounting of the hazards ahead for U.S. troops. Excellent point, but let's not leave out the thousands of mercenaries and tens of thousands of contractors. OBAMA: "We have met our responsibility." THE FACTS: That depends entirely on how the U.S. responsibility is defined. Sectarian division — the danger that Obama said as a presidential candidate had to be addressed before Iraq could succeed — continues to deprive the country of a fully functioning government. U.S. goals for reconstruction are unmet. And although the U.S. says Iraqi forces can handle the insurgency largely on their own, Iraq is expected to need U.S. air power and other military support for years to control its own air space and to deter a possible attack by a neighboring state. It was the U.S. that invaded Iraq, overthrew its government, disbanded its security forces and failed in the early phases of the conflict to understand the depth of Iraq's sectarian and ethnic divisions and its political paralysis. The U.S. in some minds is responsible for putting Iraq back together again, yet today Iraq has no permanent government and its security forces arguably are not fully prepared to defend the country's skies and borders. In inheriting a war he opposed from the start, Obama did not accept U.S. responsibilities so broadly. It will take time to see if his more limited view of success bears out. In May, he said: "This is what success looks like: an Iraq that provides no haven to terrorists; a democratic Iraq that is sovereign and stable and self-reliant." Al-Qaida terrorists are "not gone" from Iraq, Defense Secretary Robert Gates said Tuesday. But he hailed "an important victory against transnational terror" because "al-Qaida in Iraq has been largely cut from its masters abroad." In fact, the United States has a legal responsibility to immediately and completely withdraw and to submit itself to the International Criminal Court with a confession of war crimes and the crime of aggression, and a moral responsibility to compensate the Iraqi people and to apologize. The United States intentionally created sectarian strife, but much of the "insurgency" has always been a resistance to the occupation, something the Iraqi government will not have to handle if the occupation ends. 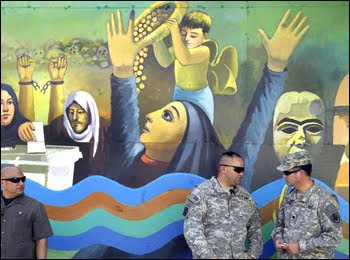 Iraq "is expected" to "need" the U.S. military for years? If that were written in the active voice who would be the subject? Who is doing the expecting here? The treaty that Obama said he would comply with requires the removal of all US forces by the end of next year. There's a loophole for non-DOD forces, such as those employed by the so-called State Department. There's no loophole for the military, no matter who expects one. Obama has not opposed the war from the start. He funded it repeatedly as a senator, and insisted on continuing it as a president. OBAMA: "Unfortunately, over the last decade, we have not done what is necessary to shore up the foundation of our own prosperity. We have spent over a trillion dollars at war, often financed by borrowing from overseas. This, in turn, has shortchanged investments in our own people, and contributed to record deficits." THE FACTS: This is partly true. For sure, the costly Iraq and Afghanistan wars have contributed to the nation's budget deficit — but not by as much as Obama suggests. The current annual deficit is now an estimated $1.5 trillion. But as recently as 2007, the budget deficit was just $161.5 billion. And that was years after war expenses were in place for both the Afghanistan and Iraq conflicts. Most of the current deficit is due to the longest recession since the 1930s. It has seriously depressed tax revenues while increasing costs to the government — including social safety-net programs such as unemployment insurance and spending by both the outgoing Bush and incoming Obama administrations on stimulus programs and on bailouts of banks and automakers. War expenses "were in place"? This is a very large and dangerous lie. Simply because congress can be expected to always continue funding wars infinitely, we don't have to pretend that they are somehow already pre-funded. Numerous times during the last year and the year before that and the year before that and the year before that, the House and Senate have had to vote on whether or not to fund more war. Each time, the Pentagon has moaned in pain about the desperate need for more funding. If the funding had already "been in place" years ago, what sense would any of this have made? Blaming the deficit on the recession misses its largest causes. One of them is the tax cuts for the super-wealthy that have been put through in the past decade. The other is the wars and the Pentagon. The Pentagon eats up a trillion dollars a year. The wars in Iraq and Afghanistan have already sucked up over a trillion dollars in taxes, and have had a multi-trillion dollar impact on the economy contributing to that recession the AP blames as if it came about all on its own. OBAMA: "This was my pledge to the American people as a candidate for this office." THE FACTS: At one stage of the presidential campaign, Obama spoke of an earlier departure of troops than he ultimately achieved. "I have put forward a plan that will get our troops out by the end of 2009," he said in a January 2008 Democratic candidates debate. But his pledge for most of the campaign was to withdraw combat troops within 16 months, a promise essentially kept. Actually, his quick promise at rally after rally was to make ending the war the first thing he did. The war has not ended. Yes, 2009 has passed, but so have 20 months, which is not the same thing "essentially" as 16 months, but 4 more than 16 months. And there are still 50,000 troops plus mercenaries and contractors in Iraq. OBAMA: "Our dedicated civilians — diplomats, aid workers, and advisers — are moving into the lead to support Iraq as it strengthens its government, resolves political disputes, resettles those displaced by war, and builds ties with the region and the world." THE FACTS: Although Obama said the U.S. commitment to Iraq's future does not end with the combat mission, he made no mention of an emerging debate in Congress over paying for the diplomatic mission the State Department says is necessary. Plans for U.S. diplomatic posts in Iraq already are being scaled back as Congress sees the winding down of the war as a signal to invest elsewhere. Neither Obama nor the AP makes mention of the major military presence in the form of mercenaries planned to guard the massive diplomatic presence whose existence may be intended primarily as something worth guarding, in other words an excuse for the mercenaries to be there. OBAMA: "Within Afghanistan, I have ordered the deployment of additional troops who — under the command of Gen. David Petraeus — are fighting to break the Taliban's momentum. As with the surge in Iraq, these forces will be in place for a limited time to provide space for the Afghans to build their capacity and secure their own future." THE FACTS: Obama is reciting almost the exact language of the Bush administration's rationale for the Iraq surge: to buy time and space for the Iraqis to reach political accommodations and to strengthen their own security forces. That's quite a change from Obama's stand as a presidential candidate, when he criticized it. Obama seems to be embracing the troop surge logic now, even though it's clear that the Iraqis have yet to achieve the necessary level of reconciliation to form an enduring government. Not only did the Iraq surge not achieve its political goals in Iraq, it also did not create the reduction in violence. The surge was miniscule. Important factors not mentioned here include: the promised withdrawal, the begun withdrawal, the bribes and negotiations, and the devastating levels of death and displacement in Iraq. These factors are not there in Afghanistan, a different place geographically, culturally, in terms of population distribution, and a different place because the United States has NOT named a date by which it will get the hell out. Marja failed. AP forgot that.